If you're lucky enough to live in part of the country where a hog trap will bring you any measure of success, you should give some serious consideration to building or buying one as part of your survival preparations. 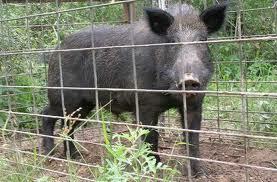 A typical wild hog weighs around 120 pounds, most of which is solid muscle. This will produce a few week's worth of meat, as well as a source of lard and a hide which can be tanned. Size - the main thing that you'll need to consider is the size of your hog trap. The door way should be at least three feet in height and two feet in width to allow the hog to pass through without touching the sides. If it feels metal against its skin before it's fully in the trap, it will panic and may end up breaking your trap. You should also have a large internal area so that you can capture multiple hogs as they often travel in groups. Strength - the typical hog trap is made out of reinforced steel which makes the trap expensive, but even though it will be cheaper to make your own, you'll struggle to find the industrial strength materials needed to keep any captured hogs secure until you're ready for them. You should also ensure that you invest in big strong bolts to make sure the connectors remain in place in case of an attack. Securing to the ground - once the animal realizes that it's trapped, it will crash around the enclosure, looking for a weakness that will allow it to escape. Your trap, therefore, will need to screw into the ground somehow, preferably with long bolts. You'll need to dig out foundation holes and you'll find it a lot easier if you can use quick drying concrete in which to set the holes or bolt fittings. Once you've built your trap, you'll need to spend some time preparing for your visitors. Alongside a sturdy trap, prebaiting is the single most effective way to capture a hog. Ideally, you want all the hogs in a sounder to enter your trap but this can be difficult when there are older hogs or ones that have been captured before. Start by laying a good amount of feed, usually shelled corn or sweet potatoes, around the entrance to your trap for a week or two before you want to capture the hogs. After this time, start to lead a trail of food into the trap, propping the door open so they won't panic when they're in there. You may want to invest in an automatic feeder to help you keep the sounder, or group of hogs, coming back without having to visit the site and leaving human scent at the scene. To use a hog trap to capture a large number of animals, place a large amount of grain on the far side of your enclosure. This will lure all the hogs in and once the big supply has gone, they will start looking for a secondary food source. This should be next to your trigger mechanism, which will become released as the hogs push each other around to get to the food. You can then go and make your selection at your own leisure. Remember this is all about survival, so take what you need first, and also weigh up the cost of feed & food to lure the hogs against your own survival supplies.